Teeth darken over time from food, drink, medications, smoking, and aging. Medical Center Dental in Houston specializes in whitening teeth via bleaching, which is a safe way to enhance your appearance and create a more youthful smile. There are many different ways to whiten your teeth from over-the-counter bleach (ex: Crest White Strips, Colgate, Rembrandt, etc.) to professional strength whitening agents in a dental office. All methods produce results; however, professional-grade products used by a dentist are proven to produce the whitest smiles. At Medical Center Dental, we have found that a combination of in-office power whitening and home bleaching gives the best results. Unfortunately, not everyone is a candidate for bleaching. Tooth whitening can whiten natural teeth, but will not change the color of fillings or crowns already in your mouth. These restorations may need to be replaced after whitening. Some people may suffer from cold sensitivity related to gum recession. Usually we can work around this problem by covering the exposed root surfaces prior to bleaching. Pre-medicating with anti-inflammatory medication also helps to prevent sensitivity. Medical Center Dental’s whitening technique is effective because we lighten teeth over a two week period. This process includes a total of four hours of dental office bleaching and 10-14 days of home bleaching. We begin by doing a two-hour in-office procedure those results in an initial lightening of the teeth. During this visit we take impressions and make customized trays for you to use at home. These trays are used for home whitening every night over the next two weeks. You will be asked to refrain from consuming dark foods and drinks to maximize the bleaching process. 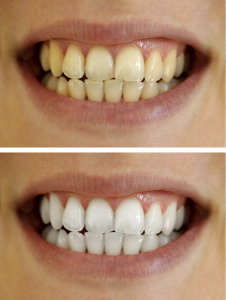 After the home bleaching, we bleach your teeth for two hours in our office again and then place a sealer on your teeth. It is now safe to resume consumption of stain-producing food and drink because your teeth are sealed. The American Dental Association has granted its Seal of Approval on whitening via bleaching. It is a safe process that will cause no harm to your teeth. However, you can expect to experience some slight sensitivity in your teeth and gums for a short time following tooth whitening. Some patients may have more sensitivity because the nerve chambers in their teeth are larger. For these patients, we recommend using an over-the-counter product that helps with tooth sensitivity when using our professional home bleaching system that uses trays. Bleaching is not recommended for pregnant women. It is hard to predict the outcome of tooth whitening. Every patient’s teeth will accept the bleach differently. People who begin with very light teeth cannot expect to lighten as much as someone with very dark teeth. Success with the process also depends on the level of patient cooperation. The staff at Medical Center Dental in Houston is more than happy to answer all of your teeth whitening & bleaching questions. Please schedule a consultation with us today.